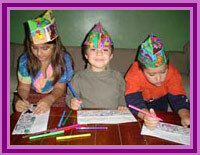 Welcome to the economy and versatility of coloring hats, the paper hat that children color, sticker and decorate. Take a look! Coloring hats come fully assembled, one size fits all. 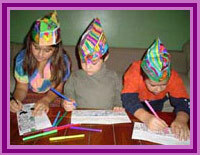 Coloring hats are available in over 50 different themes. 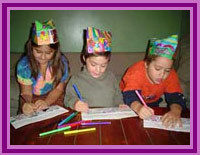 If you are looking for the perfect project to satisfy a group of children, coloring hats will deliver fun and creativity. Use crayons, markers, stickers, stars and water colors. Add wrapping paper trim, cotton balls, feathers, transfers and construction paper cut outs. Sticker or stamp the top of the hat with your logo for lasting publicity. Coloring hats unify a presentation. They unite an activity. Put on the music! Have a parade! When the children wear their hats the scene looks great!